Starting this fall, The Stranger—the smart, funny, irreverent, Pulitzer Prize–winning guide to Seattle—will publish on a biweekly schedule (for those keeping score at home, that’s 26 issues a year). 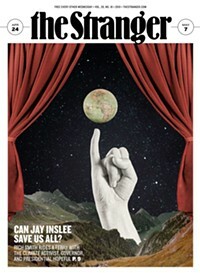 We will print the redesigned Stranger on heavier stock, staple-bound, and with magazine-style trimmed edges. The ambitious new format will include a higher page count, longer feature stories, an expanded events calendar, and, of course, more writing from the reporters and critics our readers love. We know this is a big deal, and this is why we’re doing it: Local media has to constantly evolve to stay relevant to readers and valuable to advertisers. We have to make sure that we’re delivering our journalism in a medium-appropriate way. And today’s Stranger readers use our website and mobile apps to find out the latest in news, arts, politics, food, and music—content they read in a hurry and on the go. They take our print publications home to read our features, often saving them and referring to them repeatedly, and using them to make longer-range entertainment plans. And for those wondering (reasonably so, it is a difficult time for many in the newspaper world): We are profitable, we have been growing financially for years, we have money in the bank, and we are not cutting staff. The Stranger’s audience and influence has grown even as the media landscape has changed over the last 25 years. Our readership, across all of our online and print publications in Seattle, has nearly doubled over the last five years alone. We have added new titles to a growing roster of local publications (Seattle Art and Performance, The Stranger’s Visitors’ Guide to Seattle, special food publications, and more). We launched our Things To Do online calendar and smartphone app (900,000 page views per month), beefed up breaking news on Slog (The Stranger’s blog), and in 2016, implemented a full-site, mobile-friendly redesign. We want to create the best experience for our readers, however they come to us. In print, that means a publication that’s more durable, beautiful, and longer lasting. We’re working with the brilliant Corianton Hale at Headquarters design to help update our look. The new format will display our iconic cover art better and allow more room for the award-winning work by the city’s best writers—and not come apart so easily in your hands. It also means our event listings will go well beyond the next weekend. The people who read The Stranger in print are the most active people in Seattle. They go out, they see plays and art, they fill our clubs and restaurants, and they vote. Stranger readers are shaping our growing city. And in the fall, we will give them a bigger, more beautiful, more useful print publication.